Brazil’s President Michel Temer flew over some of the flooded areas and pledged federal aid for the affected areas. SÃO PAULO, BRAZIL – Heavy rains registered in the last few days in both the Northeastern and Southern regions of the country have left tens of thousands homeless and at least seven dead, according to officials. A state of emergency has been declared in several municipalities in the states of Alagoas, Pernambuco and Rio Grande do Sul. President Temer has emergency meeting with officials in Pernambuco to talk about flooding, photo by Alan Santos/PR. On Sunday, Brazil’s President Michel Temer, flew over and inspected flooded areas in the Northeastern states of Alagoas and Pernambuco, before meeting with the states’ governors and pledging federal aid for the affected areas. “There are two fronts,” President Temer told journalists before meeting with area governors. “One is an emergency, which is already being taken care of by the Ministry of Integration and also by the presence of the Minister of Education and Cities, in the recovery activities in these municipalities. The other is more long-term and concerns works that must be completed on a preventive basis,” added the President. In Pernambuco, President Temer announced federal funds and a R$600 million credit line from the BNDES (Brazil’s Development Bank) not only to rebuild but for flood prevention works. According to officials the number of homeless and displaced people in the state totals more than 44,800. The latest reports show at least three dead in Pernambuco and four dead in Alagoas in addition to dozens of missing because of the heavy rains. According to officials, men from the armed forces and national civil defense capital have been sent to Maceio, capital of Alagoas, to coordinate aid works and help hundreds of displaced persons currently in make-shift shelters across the city. “Maceio has not suffered from such heavy rains for such a long duration of time in quite awhile,” Mayor Rui Palmeira stated in a press release. 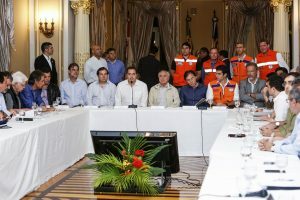 “Work teams have been attending to occurrences, clearing roads hit by falls of barriers and attending homeless and displaced, but we need a lot of the national support to face this calamity in Maceió,” added the official. In the Southern region of the country, the hardest hit with heavy rains has been the state of Rio Grande do Sul. On Monday morning, state officials had declared a state of emergency for twelve municipalities.